Decide if you want to adopt a cat or dog and take care of your new pet. Select an item's name on the menu to use it. click again on the item's name to hide it. 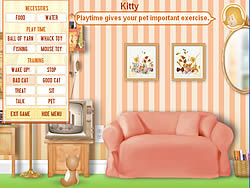 Place food or toys in a room to lure your pet out of another room. If you don't take care of your pet, it may become a naughty, noisy pet!